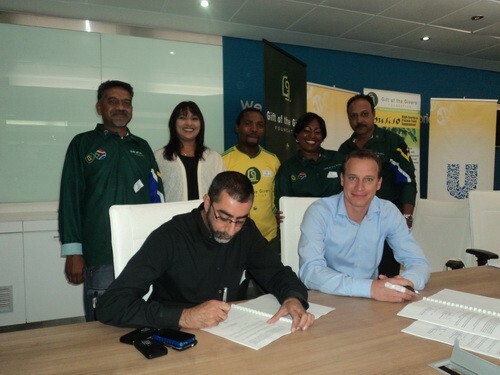 During a landmark occasion on 22 May, Gift of the Givers and Unilever signed a partnership contract at the Unilever Head Office in Umhlanga, Durban, in the presence of several managers, directors and distribution management teams from both agencies. All surplus Unilever stock, as part of the company's corporate social investment (CSI), will be channelled through Gift of the Givers to needy recipients throughout South Africa. This distribution arrangement has been in place informally since 2010, when Logas Naidoo, reverse logistics officer for Unilever, contacted Salim Sayed, Gift of the Givers KZN project manager, to discuss the possibility of a partnership, having witnessed Gift of the Givers' activities on the SABC programme, Eastern Mosaic. In 30 months, in excess of R30 million worth of quality Unilever products have been distributed throughout South Africa by Gift of the Givers. “We had to expand our warehouses and increase our vehicle fleet given the sheer volume of supplies pouring into our facilities. In keeping with our expansion programme, Dube Tradeport is establishing a R35-million state-of-the-art Logistics Facility at King Shaka International Airport, for Gift of the Givers,” said Dr Imtiaz Sooliman. The formalisation of the three-year agreement signed by Bas Jansen, customer service excellence director at Unilever, and witnessed by Kenneth Moodley and Anil Chendip, acknowledges Gift of the Givers as the preferred beneficiary of Unilever's CSI programme.